* If anyone is having trouble understanding why Bernie Sanders is failing to connect with African American voters, they should read Jonathan Capehart. A lot of it has to do with choosing people like Cornel West (who has viciously attacked President Obama by saying things like, he “has a certain fear of free black men”) to do outreach with African Americans. Our nation’s first African American president is wildly popular among African Americans. He was elected with 95 percent of their vote in 2008 and 93 percent in 2012. His job approval rating among blacks stood at 91 percent, according to the weekly tally conducted by Gallup and completed the night of the Charleston debate. The subtext of all this is that, if asked to chose between supporting someone who aligns themselves with President Obama and someone who aligns themselves with Cornel West, that is an easy call for a lot of African Americans. The user’s profile has a black banner photo with red lettering that says “Get the f— out of my country.” The name attached to the profile is Donald Trumpovitz and the location is “Jewmerica,” with a link to a page promoting a pro-Adolf Hitler documentary. * We often hear the case made that “elections matter” because presidents appoint Supreme Court Justices. It is also important to keep in mind that they nominate people to fill positions like Secretary of State. Those people not only have the potential to negotiate agreements about nuclear weapons and climate change, they also have the opportunity to say things like this on the world stage. Warning that corruption fuels violent extremism, Secretary of State John Kerry said Friday that the U.S. would redouble its commitment to fighting it, deeming it a national security priority. “We have to acknowledge in all quarters of leadership that the plagues of violent extremism, greed, lust for power and sectarian exploitation often find their nourishment where governments are fragile and leaders are incompetent or dishonest,” Kerry said in a keynote address to the World Economic Forum taking place in Davos. Just try and imagine a Republican president’s Secretary of State saying something like that. I’ll save you the trouble…it would never happen. * On the sixth anniversary of the Citizens United ruling at the Supreme Court, Elizabeth Warren gave a speech on the Senate floor about the need to root out the influence of money in politics and Hillary Clinton wrote an op-ed on the same topic. Both are worth reading/listening to. 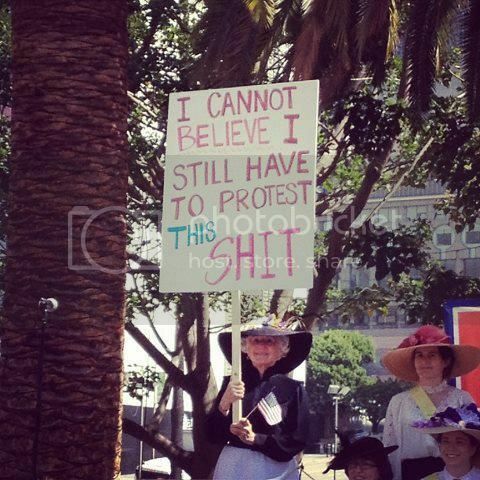 For a lot of us pro-choice old-timers, this pretty much captures how we feel about all of the recent efforts to undermine Roe v Wade.